The site was formerly a petrol filling station situated in Chelmsford, Essex. The site is relatively small occupying an overall area of 0.1 hectares. In 2006 the petrol station was closed and subsequently demolished. The developer [Anderson Group / Constable Homes] had previously obtained planning permission to develop the site for the construction of three residential units. In 2003 there was a petrol overfilling incident which resulted in a significant release of petrol into the underlying soils and groundwater. Extensive site investigations have been undertaken by Arcadis over the period 2003 – 2009. The underground storage tanks were removed in 2006 by Liquid Cargo Management Limited under the supervision of Arcadis. A Remediation Implementation Plan [RIP] was developed by Arcadis in 2007 to address the identified soil and groundwater contamination – the RIP proposed the excavation of impacted soils in combination with the use of Vacuum Enhanced Recovery (VER) and an Oxygen Release Agent to address the residual groundwater contamination. The impacted soils were removed in 2009 by Toureen Mangan supervised by Arcadis. In 2010 it was concluded that the site remained contaminated with a groundwater contamination plume (including free product) migrating off the site in a northerly direction. Arcadis recommended the implementation of VER to address the residual contamination. The major disadvantage of this recommended treatment approach was the envisaged 24 month remediation timescale for effective remediation. The VER remediation approach was not implemented. In 2012 the developer invited Envirotreat to submit remediation proposals prior to purchasing the site – this was to assess the commercial viability of the scheme taking into account the identified residual soil and groundwater contamination issues and the essential requirement to obtain necessary regulatory approvals for the proposed development. The developer needed the confidence that the site could be effectively remediated and that planning conditions could be discharged prior to purchase. The developer invited Envirotreat to attend site and reassess the site contamination issues prior to submitting remediation proposals – this reflected the time period from 2010 – 2012 during which no further site investigations or remediation had been carried out. 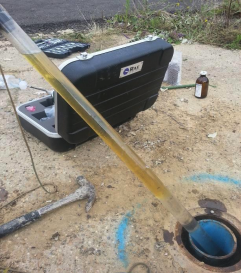 The existing boreholes were utilised for this purpose (where accessible) – the findings of this further site investigation confirmed that both soil and groundwater contamination (including free product) was still evident on the site.